I'd played the original Sacred some years ago and while it had been interesting enough, my experience with it hadn't had me jumping out of my seat when I first heard about the sequel. My initial impressions with the sequel, however, have been mostly positive. First off, the graphics are extremely impressive for a dungeon crawler, the classes appear to offer a huge number of build opportunities, and (so far) I can't say that I've ever run out of quests to do. This isn't to say that the game isn't without its flaws. One of my regular co-op buddies runs Windows 7 64-bit. Apparently the newest build of Sacred 2: Fallen Angel (2.43) does not support that OS. After some digging around on various forums and some tweaking, we seem to have found a fix that lets him launch the game and play it with minimal problems (he had to run it in XP SP3 compatibility mode as administrator, add some extra commands to his target line in his shortcut, and turn off PhysX and AA), but still, a little annoying. Also, during gameplay I often find my character snagging on little textures in the ground and a couple times my companions have gotten completely stuck in textures. Despite these flaws, however, I've been enjoying the game a good deal. Sacred 2: Fallen Angel is by no means the best or the worst dungeon crawler I've played, but it's definitely the most complicated as far as character progression goes. In the co-op campaign at least, you're dumped into the world cold turkey with little direction of how Combat Arts, Skills, and Stats work. After the first evening of playing, my friends and I decided to look more in depth at how character building works and we discovered, to our dismay, that we hadn't made some very good choices. There's no way to change decisions you've made in regards to skills, stat point allocation, etc. (not exactly uncommon to this genre, but uncommonly crippling in Sacred 2), so the next evening we promptly rerolled our characters. I'm still a little unclear on some points, but I think I'm figuring them out. Realizing how convoluted the character building system was in Sacred 2 compared to similar titles, I began to think of the other dungeon crawlers and Diablo clones I've played over the years. It's one of my favorite co-op genres and, as a consequence, I've played a considerable number of these types of games. Of course there's Diablo II, which I believe was one of the first dungeon crawler I played co-op. Dungeon Siege II and its expansion were surprisingly fun to play (I really enjoyed the classes and charge powers). 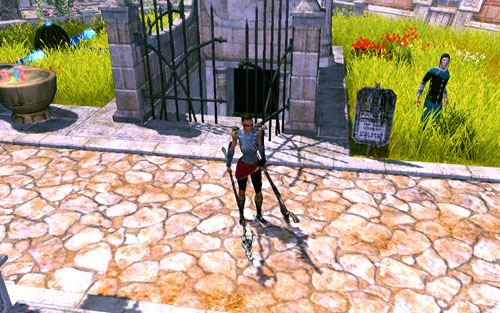 Then there was Titan Quest, which was undeniably well-done, but for some reason I had a difficult time getting into. After getting the GameCube and PS2 (which was only actually a few years ago), I played classics like Baldur's Gate: Dark Alliance and its spiritual successor Champions of Norrath (two of my absolute favorites in this department). I currently dabble in Untold Legends: Dark Kingdom on the PS3 now, which, despite its many flaws, is still enjoyable from a co-op perspective. I have noticed a trend, however, that these hack-and-slash games seem to be dying out. Of course, Diablo III is still on the horizon, but there aren't a whole lot of new titles in this genre cropping up, especially on the consoles. I'd love to see a new Dark Alliance or Champions of Norrath on the PS3 or 360 (and I don't think I'm alone in that desire), but I'm pretty sure this won't happen - and that's mightily disappointing to me. Maybe Diablo III will bring popularity back to this type of game. We can hope. In the meantime, I'll be trying out the ones I missed and probably revisiting old favorites. What are some of your favorite titles from this genre?